The Dunnville Thompson Creek Project was started over 20 years ago by a group of organizations headed by the Dunnville Bioregion Association. It was one of many possible projects identified at a week long workshop organized to develop a sustainable development plan for the Town of Dunnville. 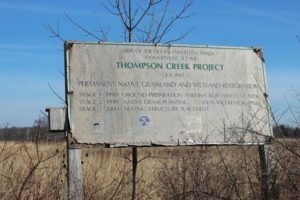 The project involved the restoration of a 45 acre site of community owned property that included Thompson Creek which was seriously degraded and in need of remediation. It was identified as an ideal opportunity to rehabilitate the creek as well as plant a Carolinian Arboretum, establish a Wetland Complex and Tall Grass Prairie Plantation. All of which would be used as a outdoor education facility for local schools as well as providing a naturalized walking trail system for the community. Over 800 trees were planted by volunteer groups, all Carolinian species were incorporated. A riparian zone was restored along the creek banks. Ducks Unlimited restored a wetland in the 35 acre field and planted it with native Tall Grass species and native wildflowers.The local Ducks Unlimited committee built the existing pavilion on site, in hopes of it becoming an outdoor classroom. However the original plan stalled allowing Mother Nature to take over. The Carolinian trees grew, the Tall Grass flourished, the Wetland regenerated and the Creeks health improved. Fast forward Dunnville Horticultural Society fresh off the success of the Dunnville Centennial Park and Fountain restoration, was approached by Dan Mckay one of the original members of the Bioregion Association. Dan felt DHS was the perfect organization to partner with and take up the challenge to complete the original project and finish the trail system. Dunnville Horticultural Society has since secured permission, along with a partnership agreement and grant from Haldimand County. Dan Mckay is the Project Coordinator with DHS Pres. Debbie Thomas as co-chair. DHS is pleased to announce the trail system including outdoor educational components will be known as Thompson Creek Eco Centre. The motto will be Restore-Educate-Preserve. It will have four distinct ecological cells. They will each have a trail system, species identification signs, large color information panels describing each of the cells habitat and ecology as well as its wildlife residents. The four cells include Carolinian Arboretum, Creek Restoration, Wetland Complex and Tallgrass Prairie. The trail around the prairie is 1.5 km, the other trail areas will be shorter providing for all hiking levels. The future hope is to link these trails to The Trans Canada Trail and the town’s existing Rail Trail that runs along South Cayuga St. from Cedar St. The parking lot at Centennial Park where the Fountain and Muddy reside, will have a large map directing the public to the the various eco cell locations. Signage will have QR codes linked to various information websites to learn about what species, flora and fauna reside within. Fundraising efforts and work on site has begun with the routing of trails. DHS has coordinated with professionals that will assist with the eradication of invasive plant species this fall (phragmites) with a controlled burn planned for the Tallgrass area early next spring. The Project is expected to be complete by fall of 2019. DHS is seeking public support, and is a non profit registered charity #886092816RR001.